●Each part has been upgraded to correspond with modern power sources while retaining Javelin’s unique original design. 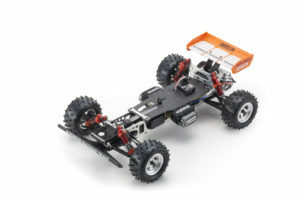 ●Simple yet high rigidity aluminum backbone type chassis. ●Two types of drive system can be selected. 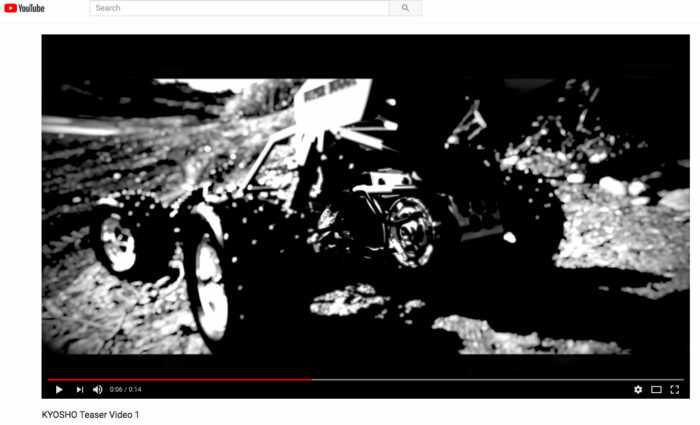 The 4WD chain system with sealed compartment that took the world by storm, or the 4WD belt system that was later released as an option. ●FRP radio plate is suitable for ESC’s of any brand. ●One-piece wheels replicate the original stylish design while delivering a reduction in weight. ●Full ball bearing specifications use 18 ball bearings. (chain drive system uses 16). ●Number of tapping screws is kept to a minimum (5), and hex heads ensure easy use and fastening security. ●Includes separate nylon helmet and polycarbonate body. 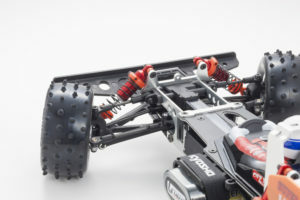 ●Velcro type battery stay (including battery straps printed with Kyosho logo) is compatible with various batteries and allows easy installation and removal. ●Equipped with antenna post compatible with 2.4GHz. Servo is securely fixed by screw. ●Equipped with metallic counter gear. The Javelin’s design concept was to create “A machine that redefines what it means to be the best”. 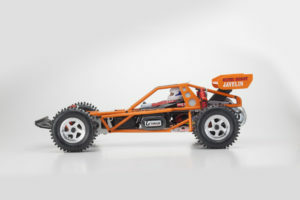 After more than 30 years since the original release in 1986, this electric off-road competition model has been recreated as the sixth model in the Kyosho Vintage Series. 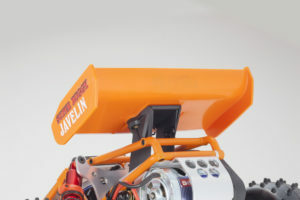 Incorporating a resin pipe-frame body resembling the innovative aluminum pipe frame body of the 1/8 scale Land Jump engine powered buggy, the new Javelin features the proven performance of double wishbone suspension with a narrow backbone-style skid frame that delivers ideal geometry for wide-angled steering. 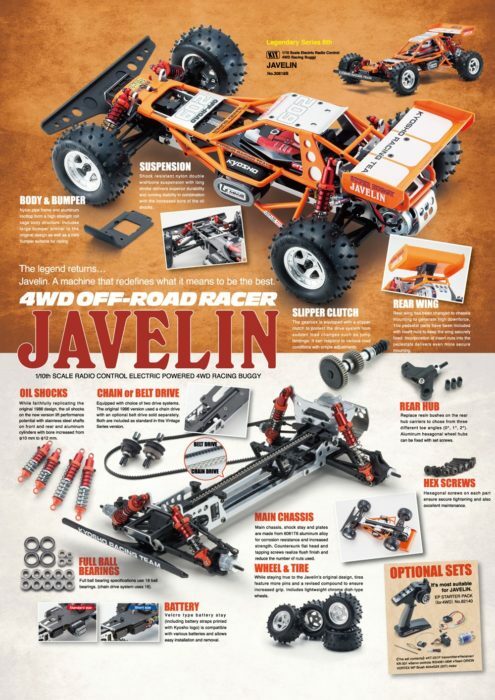 This combines with the Javelin’s superior sealed compartment 4WD chain-drive system to produce excellent performance and durability. At the heart of the external features that faithfully represent the image of the Javelin of 30 years ago, this Vintage Series version is packed with modern racing performance potential and is compatible with modern power sources. At the heart of the drive system is a counter gear equipped with slipper function and a final gear case made from metal to strengthen its load bearing capacity. The adoption of precision 48-pitch gear modules reduces power loss and the optimal combination of nylon and sintered alloy delivers both improved drive efficiency and reduced noise. 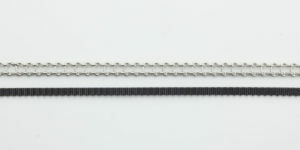 In addition to chain drive, the drive system can also be changed to a belt system, which was optional in the original model. 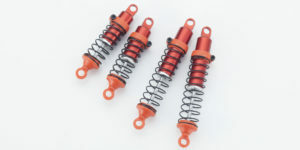 Also, the large diameter aluminum shocks, recreated in the original design, combine with long stroke suspension to deliver increased performance potential. 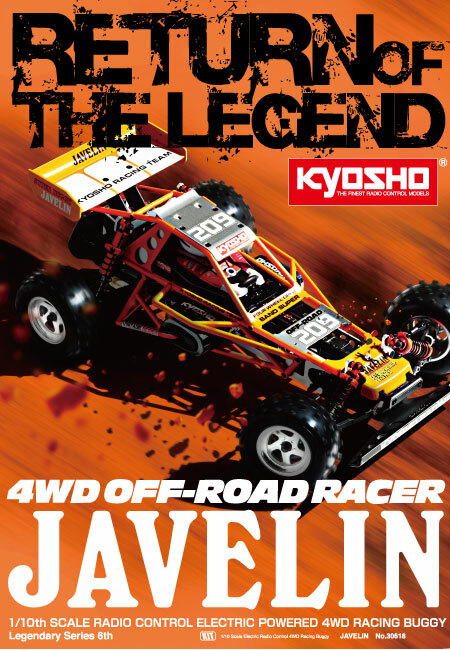 Rediscover the joy of off-road buggy racing with the latest in racing technology and the nostalgic style of the ‘Javelin’. 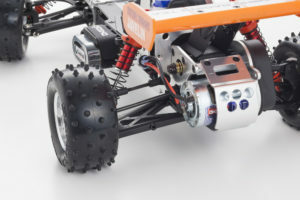 A look on the Kyosho America website also shows body color options of green, yellow or the original orange, a screw set and possibly an optional driver interior. When more details become available, we’ll update you on everything new on the 2018 Javelin. 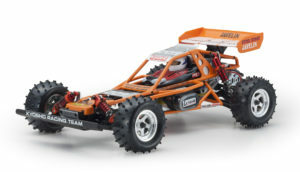 Nylon pipe frame and aluminum rooftop form a high strength roll cage body structure. 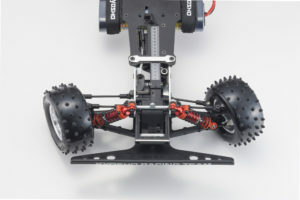 Includes large bumper similar to the original design as well as a mini bumper suitable for racing. 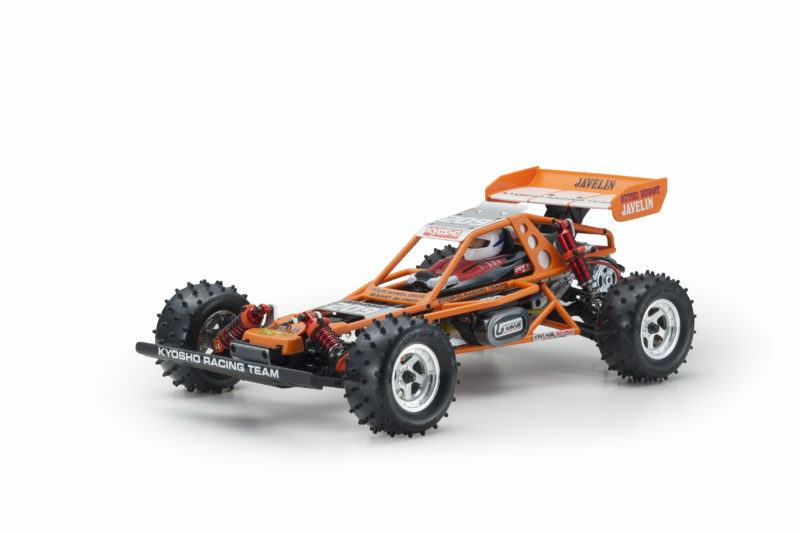 Main chassis, shock stay and plates are made from 6061T6 aluminum alloy for corrosion resistance and increased strength. Countersunk flat head and tapping screws realize flush finish and reduce the number of nuts used. The gearbox is equipped with a slipper clutch to protect the drive system from sudden load changes such as jump landings. 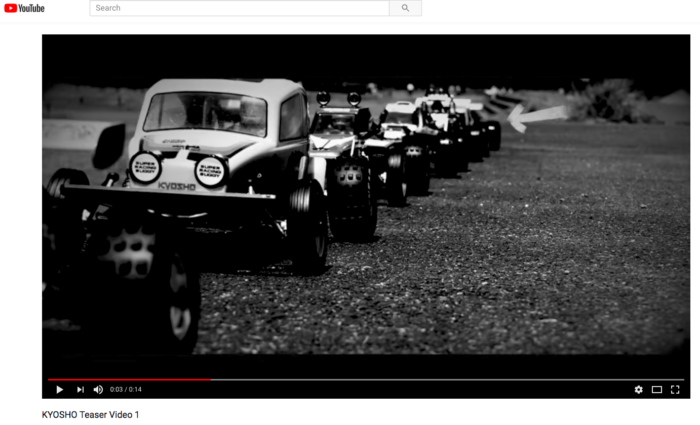 It can respond to various road conditions with simple adjustments. 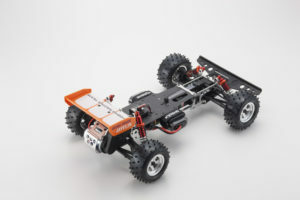 Shock resistant nylon double wishbone suspension with long stroke delivers superior durability and running stability in combination with the increased bore of the oil shocks. 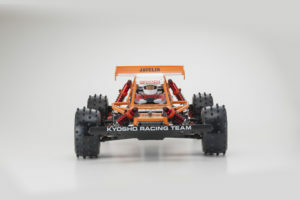 Rear wing has been changed to chassis mounting to generate high downforce. The pedestal parts have been included with insert nuts to keep the wing securely fixed. Incorporation of insert nuts into the pedestals delivers even more secure mounting. Equipped with choice of two drive systems. The original 1986 version used a chain drive with an optional belt drive sold separately. Both are included as standard in this Vintage Series version. 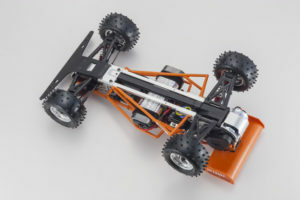 While faithfully replicating the original 1986 design, the oil shocks on the new version lift performance potential with stainless steel shafts on front and rear and aluminum cylinders with bore increased from φ10 mm to φ12 mm. 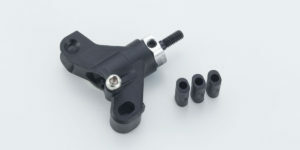 Replace resin bushes on the rear hub carriers to chose from three different toe angles (0°, 1°, 2°). Aluminum hexagonal wheel hubs can be fixed with set screws. While staying true to the Javelin’s original design, tires feature more pins and a revised compound to ensure increased grip. 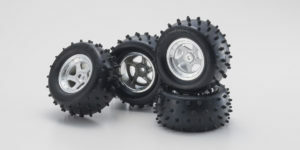 Includes lightweight chrome dish-type wheels. 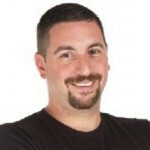 Inside Track – To Build, Or Not To Build?